HYM Originals isn’t a particularly well-known name in the audio world. The company started life as a vinyl presser for independent artists, later going on to collaborate with recording giant Universial Music Group. Yet, almost out of nowhere, it just launched one of the most interesting pieces of audio hardware to land on my desk in a long while. Meet the HYM Seed, which is currently being crowdfunded on Kickstarter. This gorgeous slab of wood and metal is the first hardware effort from the company, and boy, what an effort it is. It’s one part record player; one part wireless speaker system; and 100 percent drop-dead gorgeous. ‘Seed’ is a pretty apt name for this product. 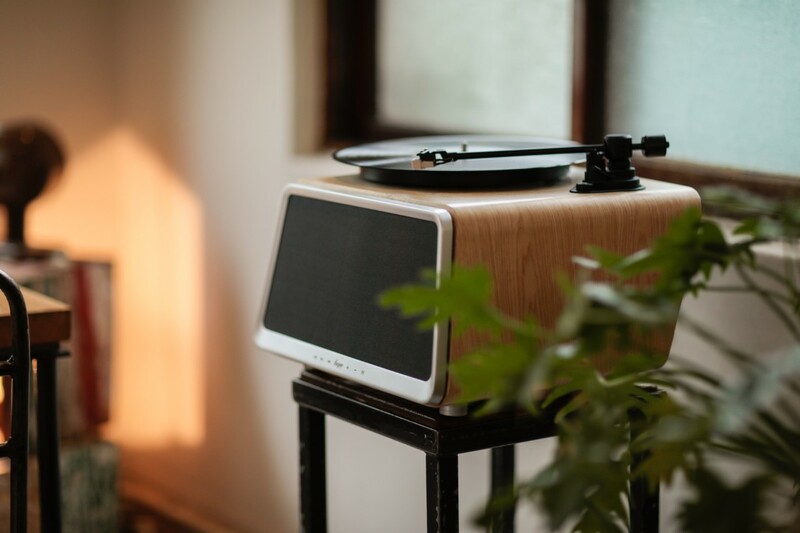 This record player has a rustic, organic aesthetic that looks absolutely gorgeous. Save for the control panel on the front and the speaker grille, it’s encased entirely in a flawless layer of wood. When I took it out of the box, it was actually pretty breathtaking to look at. I took some photos of the review myself, but I’m also going to throw in some from the media kit. These do a much better job of showcasing how gorgeous it actually is. Setting up the Seed was painless. I only had to attach the various plates that constitute the surface of the record player, and plug it in. I was finished in a matter of minutes, and was ready to fire up the Seed using the accompanying remote control. The lower part of the Seed houses its built-in speaker, which channels 70 watts of output through its two 1-inch silk tweeters, and two 4-inch woofer drivers. I’m not an audiophile by any stretch of the imagination, but I was pretty satisfied with what the Seed produced. I road-tested the device with a vinyl and digital music from a variety of genres and artists; from early 90’s hip-hop, to The Smiths, to the Hamilton Soundrack, to Julien Baker. Bass notes were gloriously rich and well-defined, while higher notes didn’t sound strained in the slightest. Spoken word came across clear, which is great if you end up pairing your phone and binging podcasts or internet radio. It’s just a really great all-around speaker system. It’s also pretty loud, and can easily flood a room with sound. At its highest volume level, it easily drowns out conversation. I can see this being used at a house party, although I only used it for personal listening in my conservatory. One of the coolest parts of the Seed is that the record player portion sits on a suspension system, which HYM Originals says it has patented. This absorbs vibrations from the speaker, thereby preventing skips. It’s also pretty good at negating the impact of knocks and jolts. Listen to a lot of records? You’ll be happy to know the Seed uses the Audio Technica AT3600 Hi-Fi MM phono cartridge. This is a really common component — you can buy it on Amazon for $25 — allowing you to easily replace it, should it break. The Seed doesn’t just tie you into simply listening to vinyl. It allows you to pair its rich and powerful speaker with your phone, either via Bluetooth or Wi-Fi. At the rear of the device, you’ll also fine a variety of wired connectivity options. The usual suspects are present, including a 3.5mm stereo AUX, SPDIF out and RCA stereo line out. There’s also a USB 3.0 port and Ethernet port, although neither was documented particularly well in the included guide. 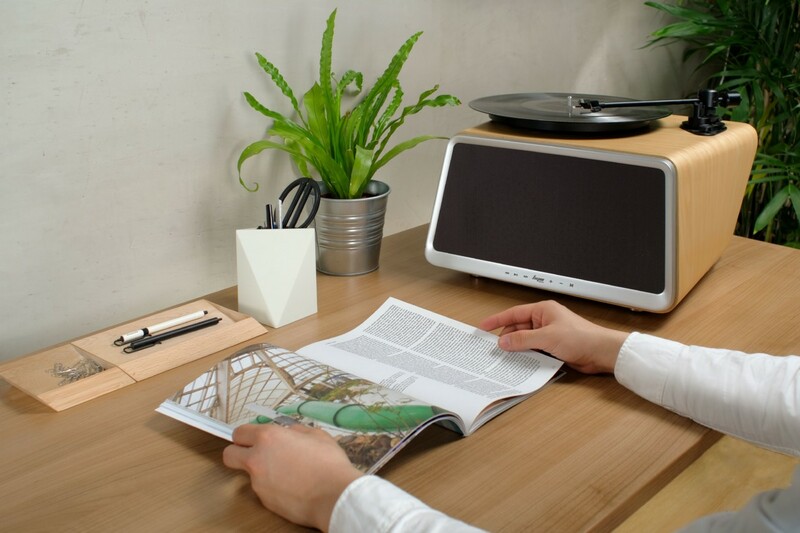 The headline features of the Seed are its Wi-Fi and Bluetooth modes, which you can enter simply by pressing the relevant button on the remote, or by whacking ‘M’ button on the device’s front-facing control panel until you reach the mode you want. 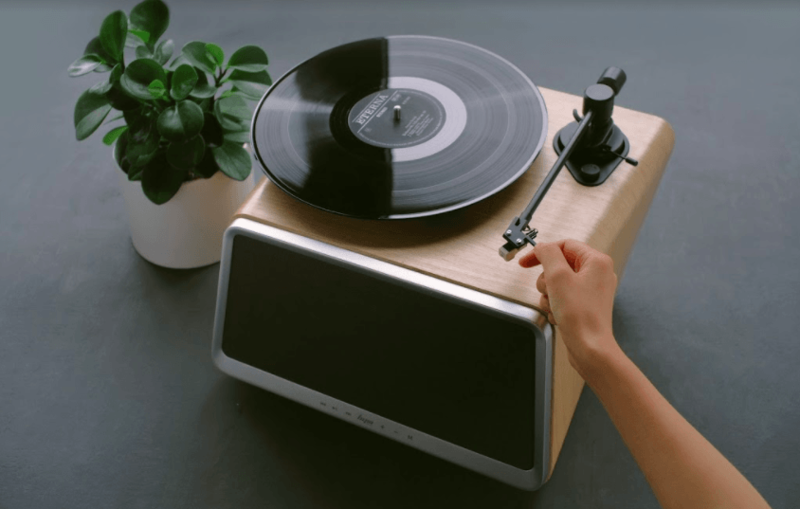 This lets you easily switch between formats, allowing you to gracefully transfer from listening to a playlist on Spotify, to listening to the another song on vinyl. The device’s Wi-Fi mode is particularly intriguing, as it allows you not just to stream music from your laptop or phone, and configure the Seed through a companion app, available for Android and iOS. At the time of writing, the iPhone application was in the App Store, but the Android version wasn’t, and had to be downloaded separately as an APK — something I admittedly wasn’t wild about. I’m happy to attribute that to the fact that the Seed is as of yet unreleased. As this device comes closer to market, I assume this will change. On the streaming side, the HYM app supports Napster, TuneIn, iHeartRadio, Tidal, and Spotify, representing a huge swathe of the streaming radio and music market. Should you be so inclined, you can also stream music to the Seed over your wireless network using either AirPlay or DLNA. You can pick up one on KickStarter for $409. That’s a discount of $326 of the expected retail price of $735. At the time of writing, HYM Originals have smashed past its initial, modest goal of $40,000. In total, 469 backers have collectively stumped up almost $200,000 for the Seed, and there are 20 days left to go. While there’s always an element of risk when it comes to backing a crowdfunding campaign, the Seed is a proven device. It exists, right now, on my side table, and it came to my house in the type of commercial packaging you’d expect from an already established product. The Seed is really expensive, admittedly. But I’d also argue that it’s good value for money. The Wirecutter’s top turntable for casual listening — the Audio-Technica AT-LP120-USB — costs $250 on Amazon. Throw in a decent pair of Bluetooth-enabled speakers, and you’re almost at the $409 mark. At its retail price, the Seed looks less like a bargain, and more like an aspirational luxury item. Which, I suppose, it is. I really enjoyed playing with the Seed. Not only does it look and sound great, but it’s also a brilliantly executed all-in-one system that demonstrates how vinyl can effortlessly mingle with newer digital formats. If I had to come up with a downside, it’s that testing it gave me an excuse to buy a shedload of vinyl. And as any record collector knows, that can be hazardous for your financial health.